Toms (adult males) weigh 18-24 pounds or more; hens (females) about 10 pounds. Plumage is iridescent bronze; dark in males and tips rusty or light brown in females. Wings and fan-shaped tail show alternating dark bands. Neck and head of adult males is reddish, while females have bluish heads with more feathers. A dewlap (fleshy growth hanging under chin), caruncles (growths located on the side and front of neck), and a snood (a fleshy projection rising above the bill) adorn males. A beard (like bristles on a broom) hangs down from the chest; typical in males and in 5% of females. Males have spurs 1/4 to 1-1/4 inch long on the lower legs. A non-migratory native of much of North America from s. Canada to c. Mexico. Wild turkeys totally disappeared from New Hampshire 150 years ago because of habitat loss and the lack of a fish and game department to regulate hunting seasons. NH Fish and Game began transplanting wild turkeys into the state in in 1969-70 (this initial effort failed), then again in 1975. Today the population is estimated at upwards of 25,000 birds. Turkeys are present in every county in New Hampshire, though severe winter weather and lack of suitable habitat limit the distribution of wild turkeys in the northernmost part of the state. Turkeys forage on the ground in flocks, occasionally mounting shrubs and small trees. Acorns, beechnuts, cherries, and ash seeds are primary food sources. Seeds, berries, grasses, sedges and insects are important summer foods. 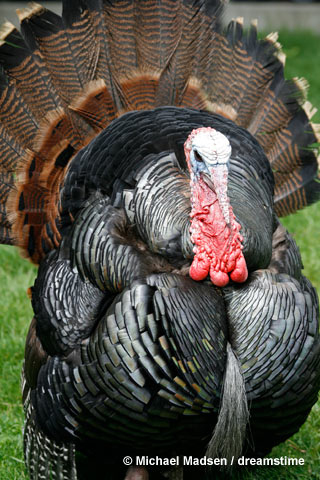 Turkeys eat corn, rye, oats, alfalfa, soybeans, millet, and buckwheat. Grit is important. Adults eat 90% plant matter and 10% insects. Poults eat mainly insects. In winter turkeys visit seeps; they feed on sensitive fern fertile stalks, waste corn, and persistent fruits such as barberry, rose hips, and dried apples. Adult males gobble to attract females and to repel competing males. Both adults make a variety of noises - yelps, clucks, cackles, purrs, rattles, and gobbles. Wild Turkeys are polygamous. Toms gather a harem of hens by gobbling, strutting, and using dramatic plumage displays. Mating occurs in April and nesting in May. The nest is typically a small depression lined with dead leaves. Nests are located in areas with a well-developed understory or in cut-over areas with slash. Hens breed in their first year while adult males ("toms") out-compete one-year old males ("jakes"). Hens lay 8-15 eggs. Chicks hatch in 28 days, typically in early June. Coyote, fox, and fisher are the major predators of adult turkeys. Hens will often abandon a nest if disturbed during incubation. In late summer, hens and their broods often band together to form large flocks. 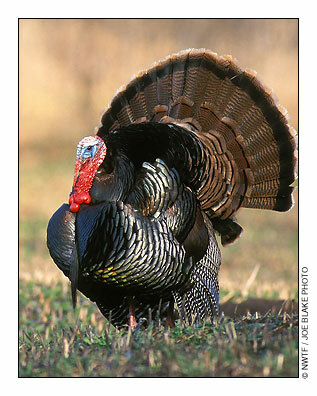 Wild turkeys take advantage of different habitats throughout the year based on their food and nesting needs. In the fall, turkeys forage in mast-producing stands of oak/hickory, oak/pine, and northern hardwoods. Hardwood stands with south-facing slopes and seep areas are favored in winter. Large softwood or hardwood trees are needed for roosting. Wild turkeys forage at farms in winter. Openings, including pastures, hayfields, burned areas, clear-cuts, blueberry barrens, and natural savannas, are a key component of their habitat. These areas support low herbaceous or grassy ground cover and insects needed for brood-rearing. Wild turkeys aren't territorial. They travel over 4 to 5 square miles during the year, although during the winter and nesting season they often restrict their movements within 100-200 acres. Turkeys are active during the day, roosting in trees from sundown until sunrise. Long rotation management that maximizes mast production is an optimal strategy. Even-aged management that effectively regenerates food sources such as black cherry, white ash, and oak is preferred. Minimize forest cutting during the nesting season (April/May/June) to avoid disturbance. Maintain key habitat features such as spring seeps, beech knolls, oak stands, understory vegetation (apples, hawthorns, witch hazel, and viburnums), and thickets or patches of juniper, sumac, barberry, grapes, and native bittersweet (be sure not to plant the invasive type). 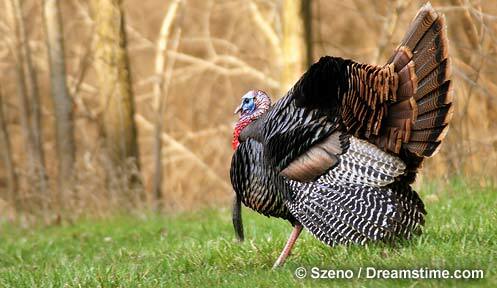 Five to 30% of a turkey management area should be in herbaceous openings. A section of corn (25' x 100') left standing through winter can feed a flock of 60 turkeys. Eastern Wild Turkey - A wildlife restoration success story!